I'm happy to share something a bit different with you today: menswear! 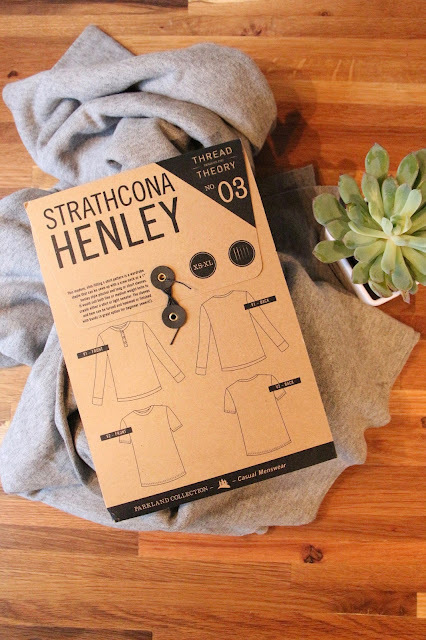 I recently made the Strathcona Henley by Thread Theory designs for my husband. He's pretty particular about his clothing and how it fits, so I was a little nervous to take on this project. In the end though, I'm so pleased with the way it turned out and he's been wearing it, so I guess that means it passed both our tests! He's a rather large person, so I had to make some adjustments to the pattern. Here are his measurements so you can use them as a reference in case you need to make changes as well. Chest width (taken only across the front) - 23"
Shoulders across back - 19"
Back (taken at his widest point which was basically armpit to armpit) - 28"
He likes his sleeves tight, so I didn't make any changes to the width of the sleeve pattern. I did however, add room across the chest and back. The pattern was wayyyyy too long, so I shortened it by about 4". 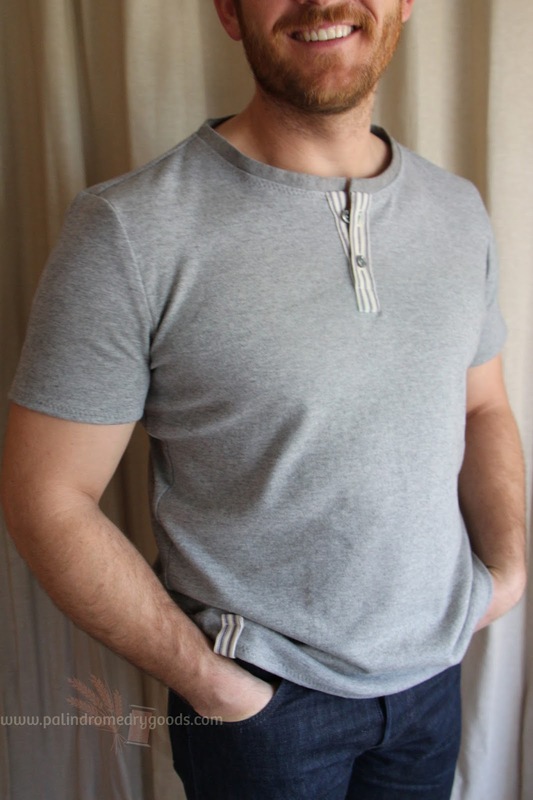 Despite my stay-stitching, after I put the neckband on, the neckline was extremely stretched out. *Insert deep sigh*. I was so disappointed. I ended up having to remove the neck band, take in the neckline at the shoulder seams and sew the neckband back on. The neckband still sticks up away from his shoulders more than I would like it to, but I've decided to let it go. It looks fine, and in reality I'm probably the only one who notices. I also ended up having to take in the top of the armscye several times to get it to fit his shoulders properly. 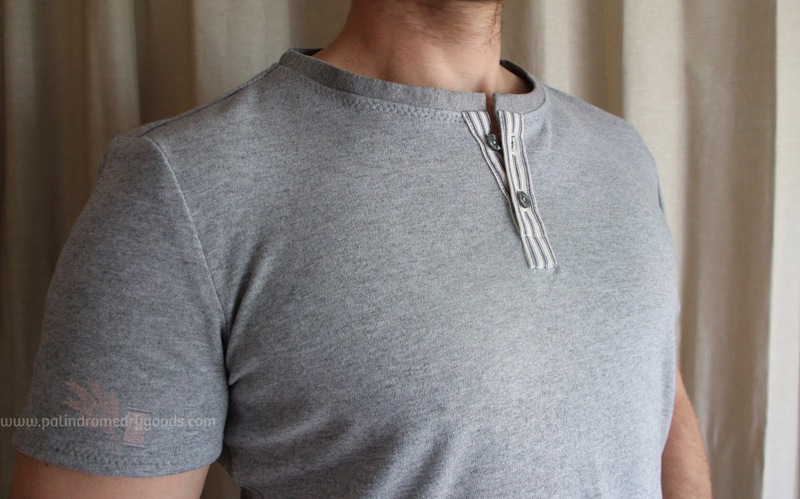 I used a simple zig-zag stitch on my Janome HD 3000 to sew the whole shirt and it did an excellent job. I used a really lovely thick wool/cotton/spandex blend available here, and ticking for the placket and a little tab detail at the hem. He wore this exact outfit out in NYC the day after we photographed his shirt, so you know he likes it! 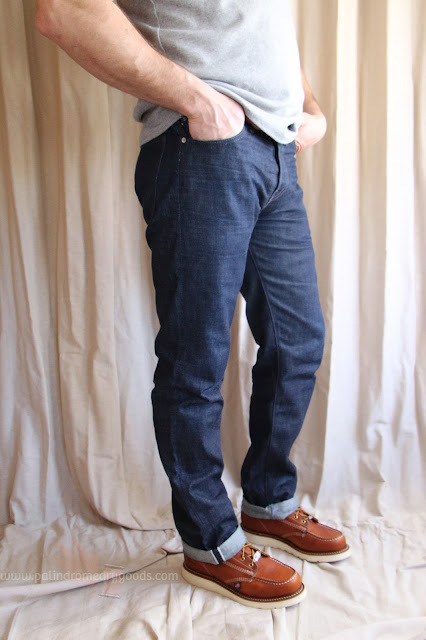 Jeans made in the USA by Hardenco, boots also made in the USA by Thorogood. 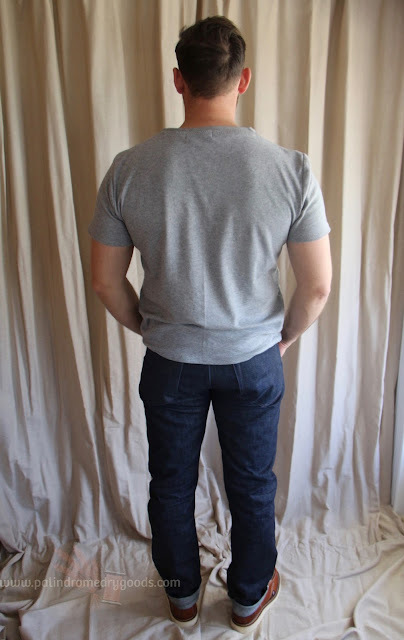 What menswear, if any, have you sewn? Anything you can recommend? I'd like to make a couple more things for him. 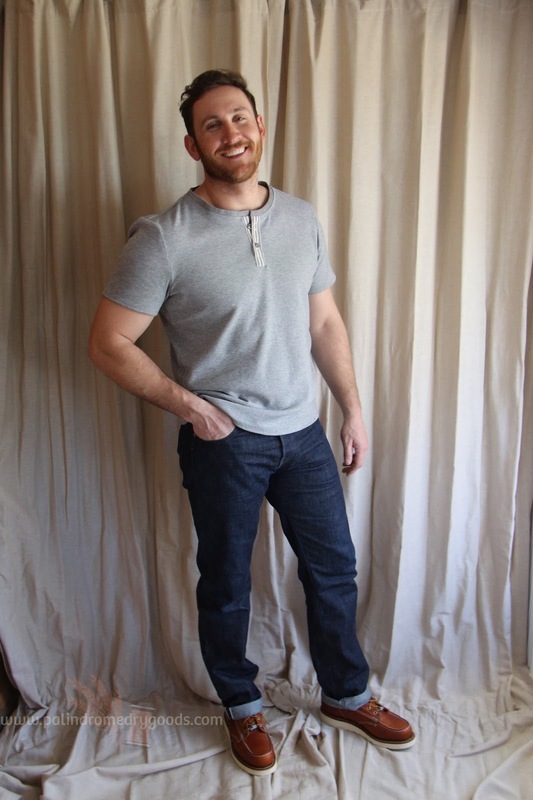 If you do sew mens wear, have you checked out Allie Jackson's #menswearmakenine on Instagram? It's a fun challenge, and although it's not one I plan on getting involved with this year, I do love seeing the projects.